It’s like driving through a postcard, only the color becomes all the more brilliant as you continue. 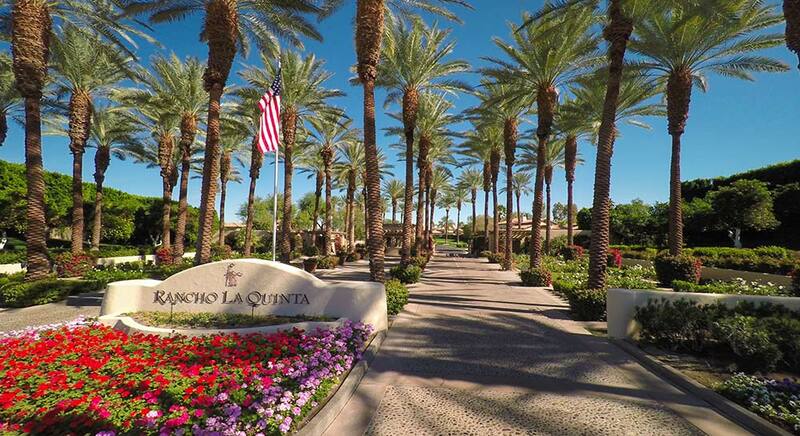 Rancho La Quinta is stunning from the moment you arrive at the magnificent palm tree grove entrance. Just beyond the gates of this private country club, you’ll find both serenity and activity. This 700-acre master planned community has 980 single-family homes and casitas. The homes are set back and on elevated sites, which command dramatic views of the surrounding Santa Rosa Mountains as well as the two private championship golf courses laced with lakes and lush foliage. Our gracious, award-winning homes are a tribute to the essence of early California, with open, flowing designs that feature courtyard entries and spacious covered patios for exceptional indoor/outdoor living. Whether your plans call for a vacation, seasonal or full-time home, Rancho La Quinta offers an incredible lifestyle at an outstanding value. All homes purchased in the Master Association or the Casitas include a Racquet Club Membership. This membership covers the use of tennis courts, fitness center, pool, clubhouse, social events and all club dining venues. With only a few new homes available for sale, the homes at Rancho La Quinta Country Club are highly desirable. Ranging from luxury Casita condominiums to larger Montanas residences, you’ll find quality homes with timeless architecture in spectacular country club settings. Current prices range from the high $400,000s to $2 million+. An enclave of 90 homes off the fairway ranging from 2,000 to 2,500 square feet. Luxury condominiums surrounding the Racquet Club. the largest homes at Rancho La Quinta with fairway views, ranging from 3,820 to 4,243 square feet.